Professional dive training to qualify as a PADI Divemaster. Home/Courses, Divemaster, News, Professional Diving Internships/Professional dive training to qualify as a PADI Divemaster. The first professional diver level of the PADI system of diver education is the PADI Divemaster. At our premier PADI 5 Star IDC Dive Centre on Gaya Island, the professional dive training to qualify, is combined in one of our highly successful GoPRO internship programs, along with other benefits to experience the real dive lifestyle. 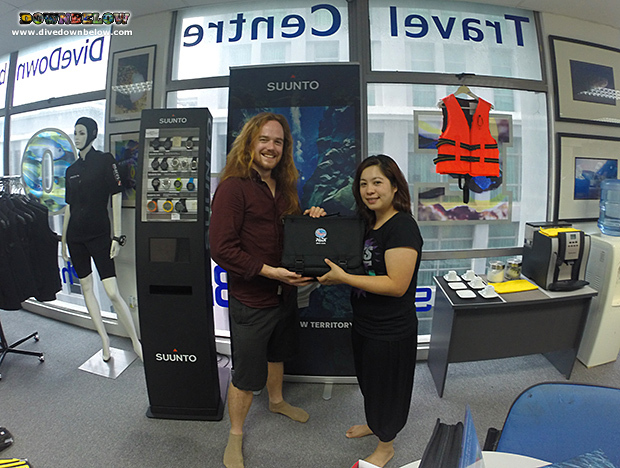 Candidate Mike Jones arrives in Kota Kinabalu for a 1-month professional scuba diving internship, and his first correspondence is our lovely GoPRO advisor and Travel Centre Manager Alice. Mike receives his PADI Divemaster CrewPak to begin his dive theory studies and prepare for his in-water skills and his final exams too. His dedicated mentor is one of our Go PRO team members, PADI IDC Staff Instructor Pablo, who will communicate with him each day of his internship on what aspect of the dive lifestyle he will experience. This could be anything from, participating in a conservation program, to assisting another one of our full time and dedicated PADI Instructors to conduct a PADI course or program for real diving clients! Get more information on the PADI Divemaster course and our Go PRO internship porgram when you contact Alice, or any of our Go PRO advisors, and start living the dive lifestyle in Sabah, Borneo! By Joanne Swann|2014-12-22T10:50:43+08:00December 21st, 2014|Courses, Divemaster, News, Professional Diving Internships|Comments Off on Professional dive training to qualify as a PADI Divemaster.